→ GMA workshop - Councilmember Windham and I attended a GMA workshop on Wednesday, August 5 in Jackson. The purpose was to explain several different federal and state programs. Agencies represented included: USDA, the Georgia Environmental Finance Authority, the Georgia Department of Natural Resources, the Georgia Department of Transportation and the Georgia Department of Community Affairs. Not much grant money was talked about although some seems to be available. GEFA has a lot of money available for loans. We might be able to use some if we install new water meters. In addition, House Bill 170 which changed how the Department of Transportation is funded this year, will allow GDOT to contract with municipalities for grass cutting along state highways. We will be talking to them about a contract for Emory Street. 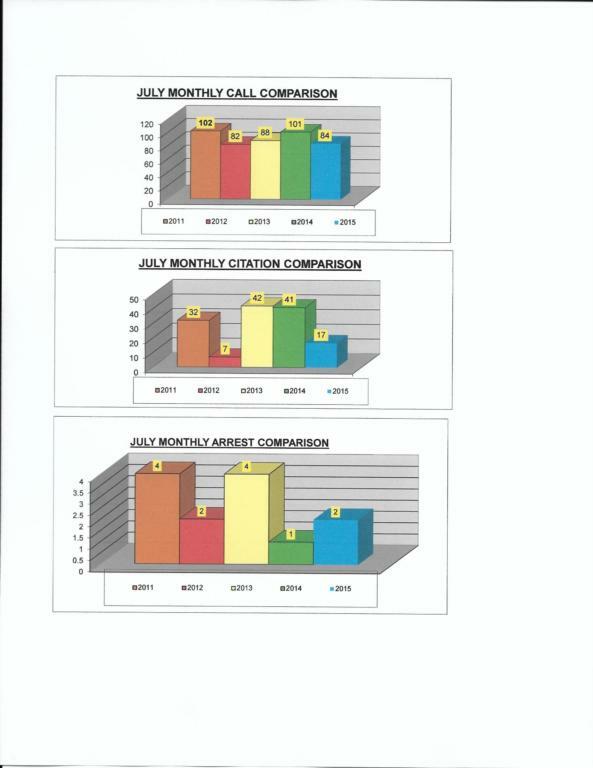 → Police Department – Here is the graph showing activity for July for the current year and back through 2011.